Create colorful wearable works using the centuries old technique of enameling! 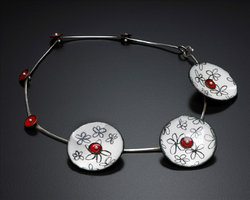 In this workshop you will learn the basics of how to apply powder enamel to metal. You can play with sgriffito, stencils, and a variety of drawing and painting mediums as you create one of a kind artworks. Ever since I can remember, I have been interested in the act of creating. From my first mud pie in the driveway I knew there was something special about being able to create by hand. It was not until I took a metalwork and jewelry design course at the University of Michigan in 1994 that I truly fell in love with metal and knew what I wanted to do for the rest of my life. I completed my BFA from the University of Michigan with a concentration in Metalwork and Jewelry Design in 1997 and then went on to acquire my Master of Art in 2001 from California State University Fullerton. I have been teaching art classes since 1998 and teaching metalworking since 2007. There is nothing better than being able to share my passion with others. Visit http://www.kirstendenbowdesigns.com/Home_Page.html for more information about Kirsten and her work.